In fall 2017, Instagram and BigCommerce enabled shopping on Instagram for U.S. merchants through shop on Facebook. This feature allowed businesses to tag products in Instagram posts, making it easier for consumers to learn more about a product with a single tap, and streamlined the path to purchase. In beta, participating stores like Natori saw up to a 1,417% increase in traffic and sales from Instagram. 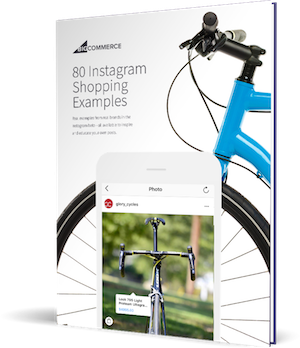 Since the end of beta, BigCommerce merchants using shopping on Instagram have seen a 50% increase in Instagram referral traffic to their site. Those two stats make Instagram a de facto sales channel for brands both in the U.S. and globally. Today, we are excited to announce that shopping on Instagram is expanding to online sellers outside of the U.S.
“While Instagram has given us the ability to connect our brand personality with our audience, social media conversation is most effective for businesses when based around product; we’ve always felt the experience would be stronger with an added commerce element,” said Rohan Moore, managing director at Olive Clothing Limited. “Shopping on Instagram offers us an elegant and intuitive way to bridge the gap between creative content and a shoppable catalogue, allowing us to increasingly position our merchandising in the social space. To sell on Instagram, the first step is to get your store approved by Facebook Shop. You can then tag products in your Facebook Shop on your Instagram posts. Facebook allows merchants who sell physical goods in select product categories that comply with their Commerce Policy to push products over to the platform. For BigCommerce stores, simply use the Facebook integration in Channel Manager to bulk sync your catalog with Facebook Shop. How to sync your catalog with Facebook. Once your catalog is approved by Facebook and connected to an Instagram business account, your account will be reviewed for shopping on Instagram. If your account is approved, you will see Shopping in Business Settings within your Instagram app. Tapping it will guide you to connect your Facebook Product Catalog to enable product tagging on your Instagram posts. The review process for shopping on Instagram typically takes a few days, but sometimes accounts need to be reviewed in more detail, which can take longer. Through shopping on Instagram, your brand can tag products in Instagram posts, making contextual information such as pricing and product descriptions accessible with a single tap, enriching product discovery without the need to leave the app. When ready to make a purchase, product tags quickly and conveniently direct shoppers to the associated product page on the your store, streamlining the checkout experience.